So here we are, settled more or less, into our new abode. It’s been a bit hectic so I have only managed to write the one post, but that shouldn’t come as much surprise to those who have moved house more than once in their lives. There are still things left to finish up and storage issues to be addressed, but other than that we are here and we are functional. As a result of the move I have a few things to share now with you. First off, let me start by showing you how your children can be inventive in ways you may not actually want them to be. Master Oh Waily is a case in point. 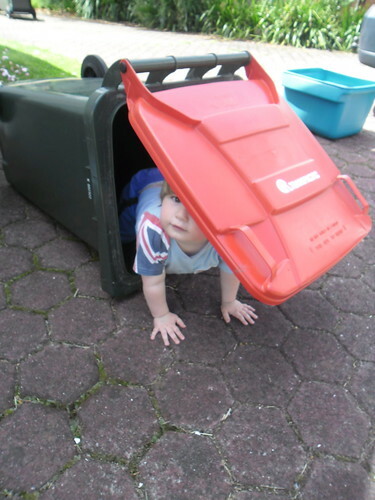 For the duration of our time here in the new house I have arranged for wheelie bins* for our rubbish and green waste. Here is what you can do with them if you are quick and they have just been delivered. 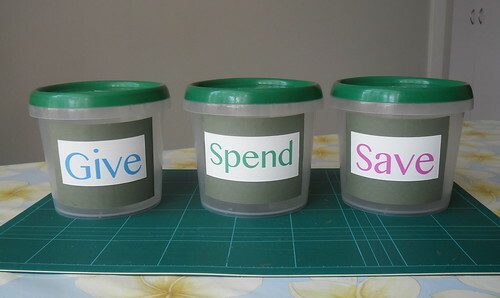 The next thing are the home made money boxes for Miss Oh Waily’s lessons in financial literacy. They certainly do not qualify me as a high end craft goddess, but considering the care and likely roughing up they will get over the next little while I think they are more than passable. They are ex-yoghurt pots cleaned out, labelled and a coin sized slit cut in the lids. Ridiculously simple to do. How do I know? Because I managed to do it. 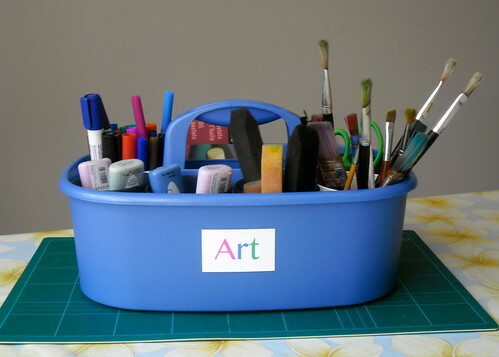 As you can see I have upcycled some old honey pots for holding paintbrushes and felt pens. We’re a bit light on honey pots in the cupboard at the moment, so the new plastic cups are doing a good job with the other odds and sods. The gap will probably be filled in with colouring pencils when the next pot comes free. The great thing about this choice is the fact that small hands can carry it from the shelf to the table. It is light enough so long as I don’t overload it with lots of heavy pots, and it can only get easier the bigger they get. Hopefully it will reduce the spillage factor and therefore the pick up arguments. And finally, since it is Christmas and this post seems to be full of cheapie ideas for fun, I have another art suggestion for you. 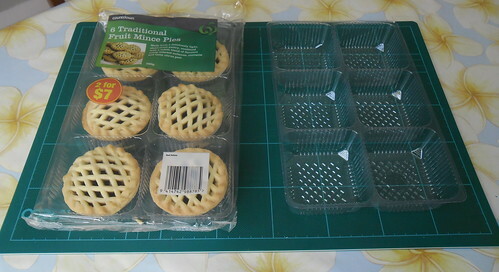 Temporary palettes made from mince pie packets. If your Christmas mince pies come in plastic trays with separate compartments, here is the cheapskate’s quick upcycled paint palette for messy kids. 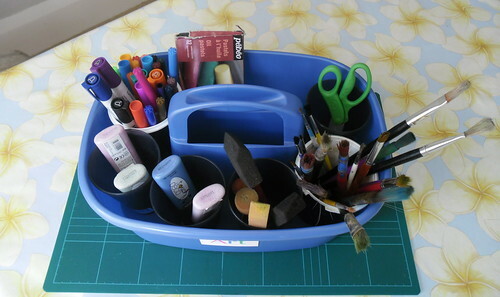 Or you could use it as a cheapie sorting tray for even younger children – just paint the bottom with the colours you have for sorting, or leave it clear for sorting shapes or other objects. Here ends the Oh Waily family cheapie ideas blog post. 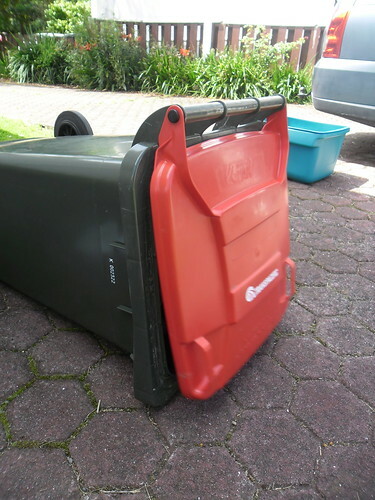 * this may not be the way it works in your part of the world, but that’s how it is in Lower Hutt – you either buy and use plastic rubbish bags, or you hire a wheelie bin. 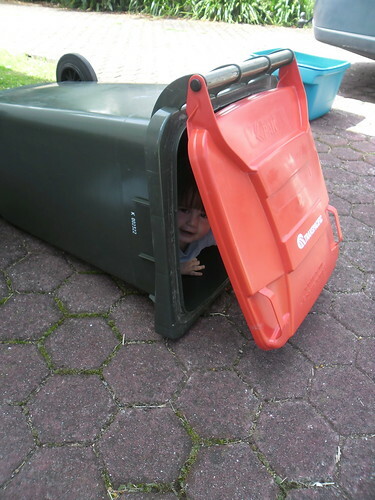 We used bags at the other house but this time around went with the bins for convenience. ** can you see a theme here. For some reason, this post is leaving me thinking of Ernie purchasing a cigar box for Bert’s paper clips =) thanks for the “crafty” tips!